What if a B’nai Mitzvah project could make a lasting change in the world? That’s what Clara Rotter-Laitman questioned as she embarked on her Jewish Learning Opportunity through the Avodah Justice Fellowship in Chicago. Together with illustrator Kayla Ginsburg, Clara created a “zine,” a homemade magazine, for Jewish students and educators to help in creating more meaningful B’nai Mitzvah projects. 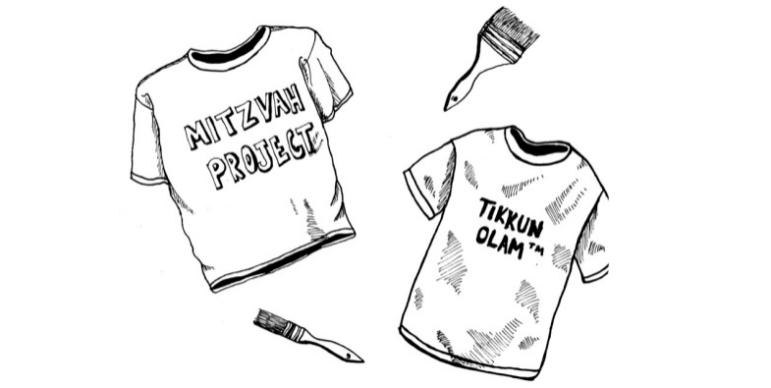 Mitzvah projects are social action initiatives that have become popular for Jewish children to take on while they prepare for their Bar/Bat Mitzvahs. Often these projects include donating to a cause or volunteering for a day. The sentiments behind these initiatives are well-intended: practice the commandment of tzedakah, charity, and encourage the act of tikkun olam, repairing the world. However, as Clara points out in her zine, one-and-done volunteer initiatives often fall short of meaningfully addressing the issues they intend to impact. For example, volunteering at a food drive is a kind gesture, if it addresses the needs of the particular food pantry, but it doesn’t prompt a budding tween to question why a community is food insecure in the first place or help to inspire a lasting solution. Maybe a B’nai Mitzvah project could do more. Clara believed that given the appropriate framework, tools, and resources to think bigger, young Jews could examine the root causes of poverty and other social issues and learn the best methods to effect change – through advocacy, direct service, philanthropy, and community organizing. 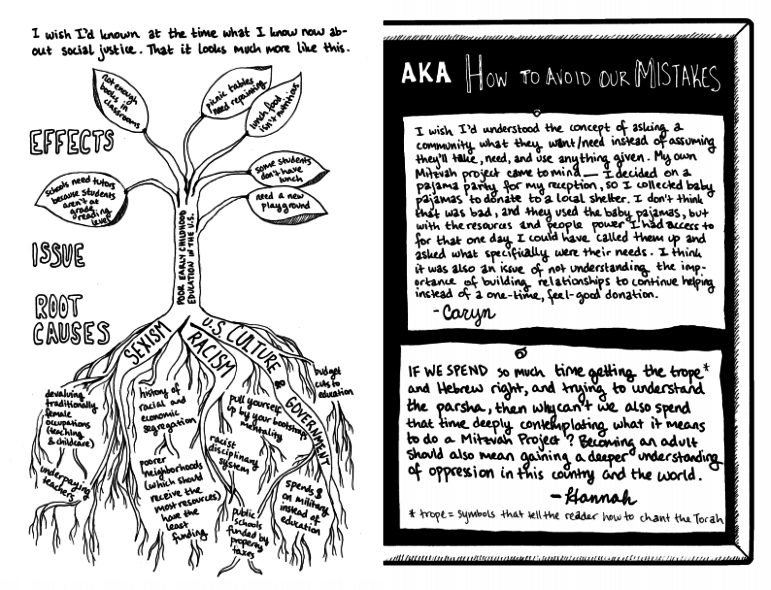 To help students, synagogues, and Jewish institutions explore what it looks like to meaningfully (and Jewishly) engage in social justice work, Clara and Kayla Ginsburg created the beautiful zine, that speaks to and illustrates the acts of learning, listening, and liberation, complete with worksheets and resources for educators. 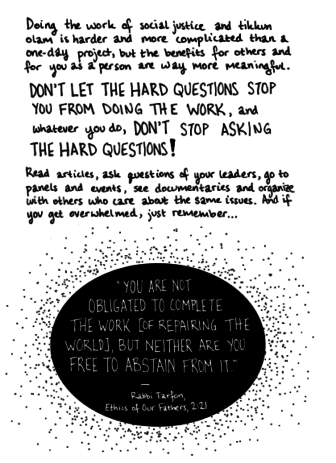 “You are totally capable of analyzing the root causes of society’s problems and doing something that makes a real difference,” Clara states in the eye-catching zine. Want to learn how you can be a changemaker in today’s world? 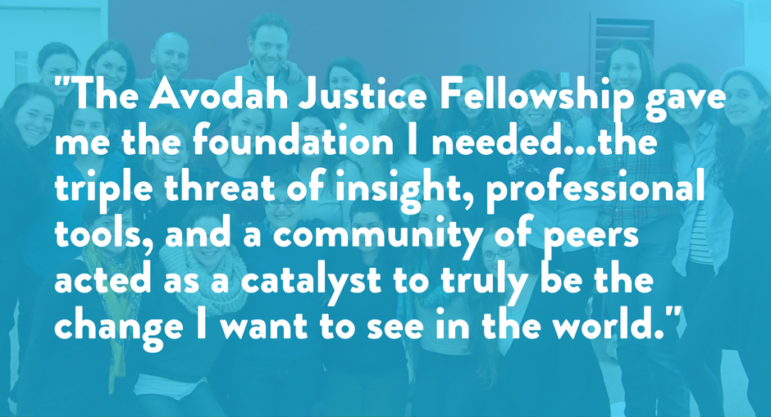 Apply to be an Avodah Justice Fellow! This entry was posted in #weareavodah, Alumni, Chicago, Fellowship and tagged AVODAH, b'nai mitzvah, bar mitzvah, bat mitzvah, Clara Rotter-Laitman, mitzvah project, Tikkun Olam, weareavodah, zine. Bookmark the permalink.